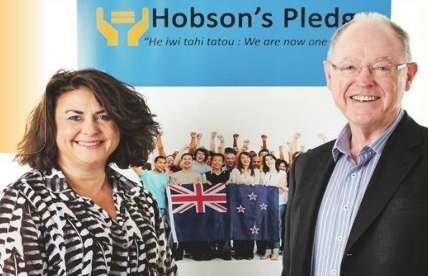 Don Brash returned to Orewa Rotary, with Casey Costello, representing the Hobson’s Pledge Trust, almost exactly 13 years since his historic speech that caused one of the biggest poll jumps that any New Zealand political party had ever seen. Casey Costello’s speech is reproduced below. This wasn’t considered racism, casual racism, institutional racism, hate speech – it was just funny. So, what has happened to the New Zealand of the 1980s — when Billy T did comedy and we were allowed to laugh? • A total of $2.47-billion in financial redress had been paid in 61 treaty settlements, as at March, 31, 2016. • The Maori Broadcast Funding Agency, Te Mangai Paho, was established in 1989 to fund Maori language programming. • By 1993, a total of 819 Kohanga Reo had been set up for pre-school children to protect the Maori language and culture. • By 1999, Kura Kaupapa Maori delivering total emersion education were designated as State schools. • In 2004, Maori TV was founded through Maori Broadcast Funding and a national network of 21 iwi run radio stations were also funded. • The Foreshore and Seabed Act in 2004 sparked the formation of the Maori Party winning four seats in Parliament in the 2005 election, going on to five seats in 2008. It appears that the message is that Maori today are crippled by events that began to unfold 177 years ago. Treaty settlements, separate Maori broadcasting, and separating Maori have been the official response to “the Maori problem”. This name-calling has the effect of shutting down debate because no one likes to be called a racist. As a New Zealander I represent our melting pot culture. I am part-Maori yet other part-Maori people say I have no authority to speak on issues that affect Maori people. To be clear, I do not speak for Maori, I speak for all New Zealanders. A treaty elite has promoted the ideology of bi-culturalism, of Treaty partnership, of Maori and non-Maori. All bi-culturalism has done is legitimise the Treaty elite. These issues exist not because of something that has been done “to” Maori, but because of what is not being done “BY” Maori. Celebrate success, invest in unity, acknowledge diversity, protect individual culture and those aspects that make New Zealand special. But – first and foremost – STOP our slide into separatism. • Extra rights for those who arrived here first. • Co-governance models based on claimed treaty “partnership”. • Favourable treatment based on imagined treaty principles. • Separate Maori representation in government, either central or local. • An allocation to tribes of fresh water in each district. • Special tax exemptions for tribal businesses. To read Don Brash’s speech, click here. Lets stop all this crap and tell the truth, the people that are called maori were picked up by the Chinese and were Melanesian and some of them were cannibals. they arrived much later after the Patupaiarehe and Waitaha and others so they were not the first here. We are all New Zealanders. When I was at Edgecumbe College in the early to mid 70’s more that 50% of the students were part-Maori; from Te Teko, Matata, Waiohou Matahina, Edgecumbe etc. There were some very bright Maori family siblings there better than me and they were chastised by other part-Maori students for doing well and called White Maori.